A DS-160 form must be filled out by all non-immigrant US visa applicants. Be sure to fill out this form carefully. American administration is extremely thorough and meticulous, and any errors or omissions could delay the process or even cause your application to be denied. Some questions on this form are fairly unusual, and do not necessarily apply to all nationalities. This article will clear up any questions you may have and help you fill out the form in the best way possible. 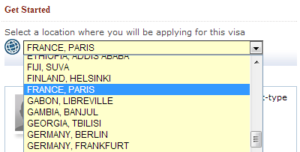 You must select the US consulate to which you will apply. This choice is very important, as applications are saved in different databases for each different consulate. As a result, the consulate agents will not have access to your application on the day of your appointment if you chose the wrong consulate, and you run the risk of not finalizing it. Start an Application: Follow this link to begin a new DS-160 form. Upload an Application: If you have chosen to save and fill out your DS-160 form offline, use this link. To do so, you must have already created a new application and user ID using “Start an Application” and saved it for offline use. Each time you save your application, you will be asked if you would like to do this. 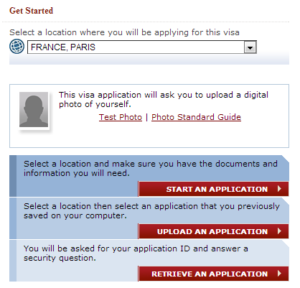 Once completed, you can upload the application into the consulate database using the “Upload an Application” link. Retrieve an Application: this link allows you to access a form that has already been started. Once an application has been started using “Start an Application,” it will be saved in the database for up to 30 days. During this period, you can access your application at any time using the ID number unique to you, the first 5 letters of your last name, and your answer to the secret question. Important things to note while filling out the application: Your answers must only include characters used in the English language. For example, accents are not accepted, so do not use “é,” “è,” “à,” or other similar characters. Surnames: In this space fill in your last name. If you have multiple surnames, write them as they appear on your passport. If you are a married woman, you may include all of your surnames here, including your maiden name even if it is filled in below. Given Names: Here, write your first name (and middle names if applicable) as they appear on your passport. Full Name in Native Alphabet: write your first name(s) including special characters and accents where applicable. This is the only field in the application where you may use special characters. Have you ever used other names (i.e. maiden, religious, professional, alias, etc.)? : if you answered yes to this question, you will be asked to fill out the fields labeled “Other Surnames Used (maiden, religious, professional, aliases, etc. )” and “Other Given Names Used.” Here, write in any other names you use or have used in the past. For example, if you are a married woman you should fill in your maiden name, or if you are a celebrity or are known by a stage or pen name you should include that here. Also write your married name and first name in the appropriate fields. Marital Status: select the appropriate marital status. Below you will find explanations for the ones that do not exist in every country. National Identification Number: Here you are asked to write in your national identification number. Fill in your social security number, which complies with the consulate’s requirements. This number is specific, unique, attributed to you at birth and with you for life. Country/Authority that Issued Passport/Travel Document: select the country that issued your passport. Note that if you have renewed your passport in a country other than your country of origin, the answer to this question is still your country of origin. Expiration Date: fill in the expiration date of your passport. Note: your passport must be valid for at least 6 months beyond the period of stay for the visa for which you are applying. In other words, if you apply for a 6-month visa starting in September, your passport must be valid until at least August. If your passport expires soon after that period, do not hesitate to renew your passport early to ensure you meet this important prerequisite and avoid any potential issues. Are there other persons traveling with you? : If you answer “yes” to this question, you must fill in the first and last names of each individual accompanying you, as they appear on their DS- 160 forms. Are you traveling as part of a group or organization? : answer “yes” to this question if you are traveling with an organized group or a group of athletes. Have you been Ten-printed: Ten-printed means you have had fingerprints done on all 10 fingers (not only 2 fingers). Have you ever been refused a U.S. Visa, been refused admission to the United States, or withdrawn your application for admission at the point of entry? : Answer “yes” to this question if you have ever been refused a visa, even if it was because you forgot to include a document in a previous application. Additional Work/Education/Training Information: Do you belong to a clan or a tribe? : this question may be surprising, but it is indeed asking if you belong to a clan or tribe. nor hats (with the exception of head coverings worn for religious purposes). Once you get to the acknowledgements page, you will be asked if you want to create a new form for a family or group member. You may elect to do this because some fields will be pre-filled with information you have already provided. You can, of course, edit them if necessary. This will allow you to more quickly complete subsequent forms. New: consult a lawyer specializing in US visas via Skype! New: USA Visa Guide offers custom listings!